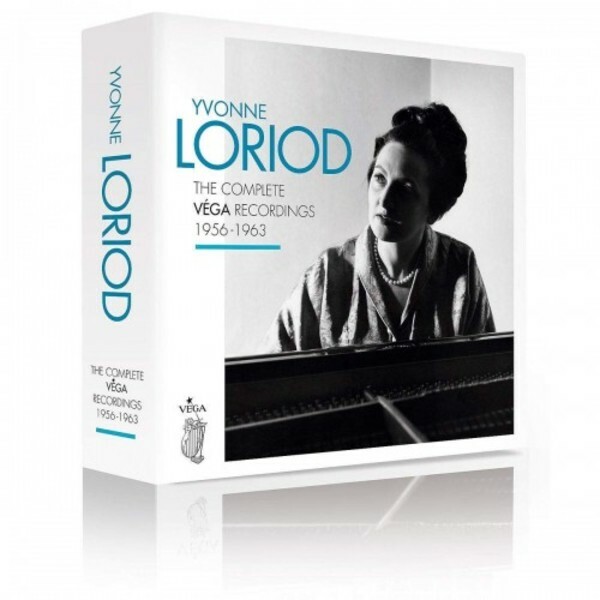 13 CDs collecting together for the first time Yvonne Loriod’s complete Véga recordings (1956-1963): many either available for the first time on CD, or released for the first time internationally on CD – including a new remastering of the Turangalîla-Symphonie with Maurice Le Roux. Presenting a survey of Loriod’s vast piano repertoire from Mozart to Chopin to Schumann, Liszt, Albéniz and De Falla, through Berg, Barraqué and Webern, to Messiaen and Boulez; and including no less than eleven world premiere recordings. Featuring recordings with Olivier Messiaen, Pierre Boulez, Jeanne Loriod, Rudolf Albert, Maurice Le Roux, Orchestre National de la RTF, Les Concerts du Domaine Musical. Yvonne Loriod’s reputation was not only due to her unique relationship with her husband’s music: she was one of the most powerful and persuasive of advocates of the music of the twentieth century at a time when hardly any pianists anywhere were playing – or could play – modernist behemoths like Boulez’s Second Sonata or the Barraqué Sonata. Her repertoire – and indeed her reputation – went beyond the music of composers such as Boulez, Barraqué, Bartók, Jolivet and Henze, she was also lauded for her Mozart, Chopin, Schumann, Berg, de Falla, and Albéniz, among many others. Loriod’s performances, in gowns of vibrant colour, were exciting to watch, and even more so to hear with her avian qualities of agility. (Messiaen would apologise to other pianists negotiating his music, explaining that he never had to worry about its difficulty as he knew that Loriod could play anything.) In her extraordinary range of timbre, achieved not only by touch but also by the split-second timing of attack and pedaling, she brought to the music the rainbow brilliance and energy it needed. Though she was very reticent on the subject, she was also a talented composer, but chose to concentrate on performing and on her students and was also a respected figure on the juries of many international piano competitions. She was one of the most important musicians who helped shape the music of the 20th century, not only as a teacher and dedicated champion of contemporary composers and an exceptional pianist with a breathtakingly wide repertoire, but because her technique allowed Messiaen “the greatest eccentricities” she had a profound and lasting effect on his music – both pianistic and orchestral ... and so on the music of the 20th century. When the definitive history of 20th-century music comes to be written, Yvonne Loriod will find an honoured place as one of the most influential musicians of the time.